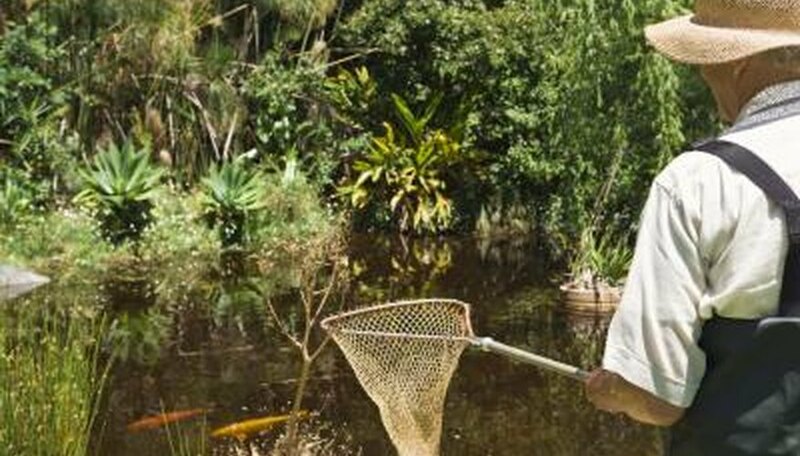 Freshwater ponds, lakes and rivers often see an influx of aquatic plants that may negatively affect the quality of the water. Grass carp, who eat just about anything green growing in the water, offer a natural method of controlling plants. Grass carp feast on invasive weeds, including hydrilla, duckweed and Eurasian milfoil. The greenery-loving fish also eat water hyacinth, a noxious spreading weed that often takes over warm water ponds, choking out all other vegetation. Since grass carp aren’t fussy eaters, they also eat plants gardeners and landowners may prefer they leave alone. Cattails and water lilies are two of the plants grass carp enjoy eating. When food becomes scarce, carp will even reach up to nibble on vegetation alongside the shore. Some aquatic plants become so well-established in ponds, lakes and rivers that they keep other native plants from flourishing. Grass carp offer a biological way to control the problem since they continuously feed on the weeds and help to restore oxygen to the water.